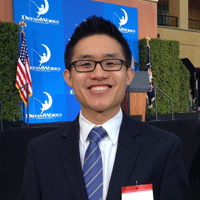 Daniel Chun currently serves as a publicist at DreamWorks Animation, a branded family entertainment company that creates high-quality entertainment, including CG animated feature films, television series and live entertainment properties, meant for audiences around the world. In his role, he manages publicity campaigns for DreamWorks’ film releases in China and Korea, as well as DreamWorks’ new television programs being distributed by Netflix. As a part of the public relations team, he also supports the company’s public relations efforts in corporate communications, technology, award campaigns, and consumer products. Before joining the public relations team, Daniel worked in film production at DreamWorks Animation as a story coordinator, as well as an assistant to the producers and directors of the Academy Award nominated film, The Croods. Prior to joining DreamWorks, Daniel also worked as a floater agent assistant at Creative Artists Agency, a leading entertainment and sports agency representing many of the most successful professionals working in film, television, sports, and music. Daniel holds a B.S. degree in Business Administration and a B.A. degree in Political Science from the University of California, Berkeley.